Over recent years, increasing amounts of evidence have shown the benefits of virtual reality (VR) rehabilitation for people with neuromuscular diseases. VR enables individuals to move through computer-generated environments, allowing users to learn new movement strategies for situations in the real world, such as maneuvering crowded areas or walking on uneven surfaces. VR allows for activity-based training by providing users with personalized, goal-oriented and repetitive practice that provides immediate feedback. The use of VR rehabilitation for persons with Multiple Sclerosis (PwMS) is a new and emerging field. Only a few studies have begun to investigate its effect on balance and motor control for this population. Microsoft’s Kinect-Software, RemoviEM: A system that uses VR and natural user interfaces (NUI) to help PwMS perform motor rehabilitation exercises. The RemoviEM consists of three motor exercises: TouchBall, TakeBall and StepBall. 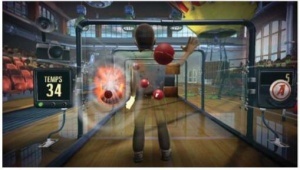 TouchBall encourages PwMS to work on balance and weight transfer as well as lateral movements of the trunk where the individual must “touch” different virtual objects that appear. TakeBall promotes coordination and diagonal movement of the upper extremities where the PwMS moves virtual objects with both hands to a specific destination. StepBall has the PwMS balance and weight transfer while performing lateral movements in a single leg stance by stepping over virtual objects that appear to avoid various obstacles. GestureTek Interactive Rehabilitation and Exercise Systems (IREX): PwMS stands in front of a television screen and camera where they will be able to see themselves in the VR environment on the screen. Various scenarios can be used to promote balance training such as Formula Racing, Snowboarding, Sharkbait and Soccer which focuses on weight shifting with trunk or lower extremities. There is a lack of research being done using the IREX System with PwMS, however, it is currently being used successfully for other neurological conditions such as stroke, spinal cord injury and traumatic brain injury. Xbox Kinect: The Xbox360® console with Microsoft® Kinect uses sensors to detect participant positioning and verbal sounds. This system uses a 3D technology that creates an avatar of the patient allowing them to take part in different virtual environments. There are a number of games available on the Xbox Kinect Software, such as Kinect Sports®, Joy Ride® and Adventures®, each with varying levels of difficulty. VR Headset Apparatus: This is comprised of a head-mounted display, connected to a wearable computer, where the user sees a virtual floor superimposed onto the real floor through the display. CAREN: An integrated reality system that creates a variety of simulated environments including 3D visual, sound and proprioceptive stimuli. The user stands on a motion platform in front of a large screen where a virtual scene is projected in front of them. VR interventions can be used in neurorehabilitation for balance, gait and motor control training. It has been suggested that the use of VR will be most beneficial for PwMS with motor deficits particularly early on in the disease progression or immediately after diagnosis. Of the studies discussed, none specified the type of MS that participants had. Moreover, no information was found pertaining to whether certain types of MS would benefit more from VR training than others. In PwMS, VR has been shown to enhance balance, postural control and ambulation abilities. Though limited research has been conducted, it has been suggested that VR can be helpful to reduce fatigue in the upper extremity which is important for PwMS who may become wheelchair bound and rely on their hands and upper limbs to use an electric powered wheelchair. For people with more advanced MS, input interfaces are now available for wheelchairs to enable their participation in VR interventions. Multiple VR systems have been shown to have significant improvements on gait training in PwMS. For example, Baram and Miller used a VR headset to simulate a tiled floor and provided patients with visual cues in a close-loop design during 10-meter walking trials. They found that the visual cueing with VR improved gait speed and step length during the VR- assisted trials as well as residual improvements 10 minutes later without the device. Following the study, PwMS reported increased confidence in their walking ability up to one week after the sessions. Limited research has been done on the use of VR systems to decrease the risk of falls in PwMS. In one study, the CAREN-VR System was used to display a “road scene” that required users to maintain their balance while walking a predetermined path. PwMS were instructed to maintain their balance as they maneuvered through areas of flat, straight and uneven surfaces. The user was asked to intercept 18 moving targets with their hand as a secondary task while walking. Results from this study showed significant improvements with patients in the Falls Efficacy Scale (FES-I). Multiple studies support the use of VR systems for improving balance and postural control in PwMS. Training using the RemoviEM System resulted in significantly higher scores in the Berg Balance Scale (BBS) and Tinetti Scale. In addition, PwMS who used the CAREN System demonstrated significant improvements on the Functional Reach Test. Similar results were seen in a single case study using the IREX system in combination with other locomotor training systems, which resulted in improvements on the BBS and Activities-Specific Balance Confidence Scale in one PwMS. However, since this study was done with a single patient and results were obtained in combination with other interventions, no direct correlation between positive changes in balance and postural control outcomes from the IREX system can be made. Lastly, the Xbox 360 console with Microsoft Kinect Software was used and followed a gaming protocol chosen based on difficulty and amount of fatigue experienced after treatment. 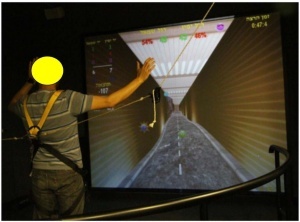 The gaming protocol consisted of three games, Kinect Sports®, Joy Ride® and Adventures®, where users were instructed to use different body parts to throw, hit, and avoid objects, climb obstacles and interact with the virtual environment. Use of the Xbox 360 Kinect Program showed significant improvements on the BBS, Tinetti Scale, Sensory Organization Test and Motor Control Test. To conclude, multiple studies demonstrated the beneficial effects of VR rehabilitation for postural and balance control in PwMS. VR rehabilitation has been shown to have beneficial effects for neuromuscular diseases. Though research on its effects on MS are still emerging, the studies discussed demonstrate the potential for it to be used as an alternative or in combination with conventional physical therapy. These systems are relevant to physical therapy as it provides therapists with a new means of treatment that can better simulate the real world and better prepare PwMS with skills needed to maneuver practical situations. The systems described can be used in therapy clinics, and some can be used in the patient's home. Further research is required to assess the effectiveness of VR in therapy for PwMS, but studies on its effects thus far show promising results. ↑ 4.0 4.1 4.2 4.3 4.4 4.5 4.6 Lozano-Quilis JA, Gil-Gómez H, Gil-Gómez JA, Albiol-Pérez S, Palacios-Navarro G, Fardoun HM, Mashat AS. Virtual rehabilitation for multiple sclerosis using a kinect-based system: randomized controlled trial. JMIR serious games. 2014 Jul;2(2). doi:10.2196/games.2933. ↑ 5.0 5.1 Fulk GD. Locomotor Training and Virtual Reality‐based Balance Training for an Individual with Multiple Sclerosis: A Case Report. Journal of Neurologic Physical Therapy. 2005 Mar 1;29(1):34-42. doi:10.1097/01.NPT.0000282260.59078.e4. ↑ Thornton M, Marshall S, McComas J, Finestone H, McCormick A, Sveistrup H. Benefits of activity and virtual reality based balance exercise programmes for adults with traumatic brain injury: perceptions of participants and their caregivers. Brain injury. 2005 Jan 1;19(12):989-1000. doi:10.1080/02699050500109944. ↑ Kizrony, R. Katz, N. Weingarde, H. Weiss, P.L. (2002). Proceedings from ICDVRAT ‘02. The 4th International Conference Disability, Virtual Reality and Associated Technology. Immersion without encumbrance: Adapting a virtual reality system for the rehabilitation of individuals with stroke and spinal cord injury. University of Reading, UK; ISBN. ↑ 9.0 9.1 Massetti T, Trevizan IL, Arab C, Favero FM, Ribeiro-Papa DC, de Mello Monteiro CB. Virtual reality in multiple sclerosis–a systematic review. Multiple sclerosis and related disorders. 2016 Jul 1;8:107-12. doi:10.1016/j.msard.2016.05.014. ↑ 10.0 10.1 Mahajan HP, Spaeth DM, Dicianno BE, Brown K, Cooper RA. Preliminary evaluation of a variable compliance joystick for people with multiple sclerosis. Journal of rehabilitation research and development. 2014 Jul 1;51(6):951.doi:10.1682/JRRD.2013.01.0023.